Panelectric® radiant heat gypsum board panels have been available in North America since the early 1950's. Many people have entire homes that are heated with them and they are ideal as garage heaters. If you can't have radiant floor heat in your garage - radiant ceiling panels are the next best system. All Panelectric® radiant heat panels are 5/8" thick gypsum board manufactured in the U.S.A. and come in a variety of size lengths that are all 4' in width. They are extremely versatile when it comes to layout and trim-able units. The technology revolves around nichrome wire embedded within gypsum board for ceiling use only. It is designed to be installed and finished in the exact same manner as standard 5/8" thick gypsum board. The diagram at the left illustrates how the nichrome conductors are placed within the gypsum board radiant electric heat panel. The conductors are spaced in such a way that you can nail these sheets at 12", 16" or 24" on-center without hitting the conductors. The down side of the board is clearly marked with these nailing locations and the mark shows a range of width where the nail or screw can be safely placed. The entire ceiling does not have to be covered with Panelectric® panels for adequate heating of your garage. Panelectric® has a complete layout and heat loss calculation guide on their website in PDF format that can be downloaded. They also show required R-values of insulation for walls and spaces above the ceiling where the radiant panels will be attached. 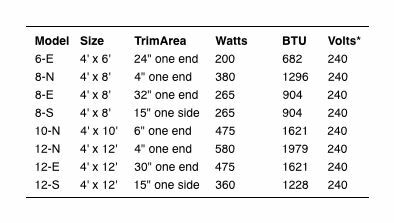 The table below shows the available gypsum board sheet sizes and their BtuH output. *208 volt panels are also available in all sizes with the same BtuH values as the 240 volt panels. The manufacturer states that fiberglass joint tape is not adequate for use with Panelectric® so you should be using standard paper tape at all seams and joints. Another tip they have provided is that when ceiling finishes are applied such as texturing, etc. that the panels can not be in the heating-mode until the finish has cured completely. The system must be run through a thermostat, and Panelectric® has one available designed just for these radiant panels. All-in-all, this type of heating system is fairly efficient if you have your garage properly insulated. It is dust free and radiates the heat downwards toward all dense objects, including the concrete garage floor. If you have 208-240 voltage available to your garage, this system could be the answer to uniform heating.